Normally used in Twin for aeration and root pruning on fine turf to 4 1/2" & 5 1/2" depth. This form of slitting leaves no surface gash and is not prone to opening during dry spells. A popular choice for winter or year round aeration with little or no surface disturbance. Part No: GTSL1 Socket Size: 1/2" Overall Length: 5 1/8"
Part No: GTSL1L Socket Size: 1/2" Overall Length: 6 1/8"
Only use in twin holders for 3" x 3" pattern. Soft to medium areas for up to 5" deep slit pattern and root pruning. Groundsman chisel tines leave a close pattern stitched effect, which is not prone to opening during dry spells. Polish on approach before going on fine turf. Part No: GTSL112 Socket Size: 5/8" Overall Length: 5 5/8"
Normally used in Triple Holders. 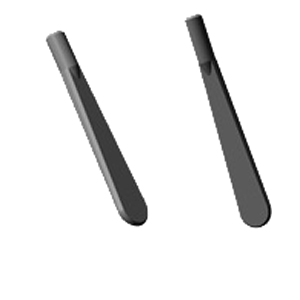 Has the hole surface area of much larger tines with little trace on the playing surface. Ideal playing season aeration to maintain oxygen, water and chemical movement. Enhances root density. Recommended by many agronomists. Part No: GTST12 Socket Size: 1/2" Overall Length: 5 1/2"
Part No: GTST12L Socket Size: 1/2" Overall Length: 6 1/2"
Part No: GTST58 Socket Size: 5/8" Overall Length: 5 1/2"
Part No: GTST58L Socket Size: 5/8" Overall Length: 6 1/2"